So what exactly is Autocross? Autocrossing is a low-speed competitive driving event. A course is set up in a parking lot with cones and cars are timed through the course. Most cars will be able to complete the entire course in second gear. The low speeds of the event mean that it's safe and non-destructive, but don't think that it's boring! 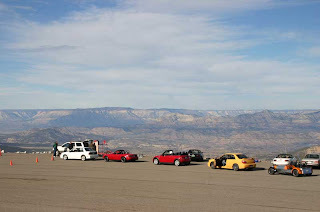 Autocrossing is an excellent way to develop car control skills and get some competition experience at low cost.